Sixty five years after the end of World War II, the second world war seems to have lost its attraction for video game developers. Storied video game franchises like Medal of Honor, Battlefield and Brothers in Arms seem to have either died off or turned to modern settings after producing more than 20 games set in the battles of World War II's six years. The last Battlefield game had a modern setting, so does the next Medal of Honor title. And after four successful World War II-based games, it looks like Call of Duty is giving up all together on that era. Activision has been flying high on the business of turning armed conflict into entertainment for nearly a decade, pumping out tremendously successful Call of Duty games every year since 2003. The publisher manages the seemingly impossible, releasing a game that takes nearly two years to make annually, by hot-swapping developers, cycling the popular series between the game's originators Infinity Ward and developers Treyarch. Last year's Call of Duty: Modern Warfare 2 was developed by Infinity Ward,. This year's Call of Duty: Black Ops comes from Treyarch. It starts with two men in space helmets. It will be the first Call of Duty game that Treyarch makes not set in World War II. Instead, the upcoming Black Ops will take place in the 60s and 70s, taking gamers through the secretive, often unbelievable, birth of modern unconventional warfare. Dan Bunting, senior producer at Treyarch, says that the transition from creating a game of war based on World War II to one that explores the cold war sparked an "explosion of creativity" inside the studio. "In the beginning, a lot of people didn't know much about the Cold War because it was so secretive," Bunting said. "But, you start doing the research, you start seeing how interesting that era was. We're just now getting the information about it and the stuff that went on was just crazy. Once we started doing the research, people started getting really jazzed about working on this." Bunting says the results will be a game unlike anything they've ever done in Call of Duty and team's best work to date. 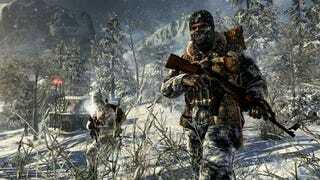 Treyarch and Activision are keeping a pretty tight lid on the upcoming shooter, but they have shown off a number of settings including the snowy mountains of cold war Russia and Vietnam near the end of that war. Bunting said the game spans a range of times, with the story arc covering a broad span of time between the late 60s and early 70s. "We haven't revealed all the locations in the game yet but I can tell you that it does take you through a variety of locations around the world," he said. "You saw some snowy Russian environments, you saw Vietnam of course, but there's much more in store that you haven't seen yet. It does take you through a variety of locales in both the Eastern and Western Hemispheres." Bunting added that Call of Duty: Black Ops will have gamers taking on the role of multiple characters over the course of the game. "The story is all interwoven, so there's a much deeper character narrative going on in this story," he said. "When the game comes out, when you start seeing more information about it, you'll see that there is a large story arc going on with multiple characters involved and you have to follow each of these different character arcs to understand how they all play together." That means a game more dependent on narrative and, perhaps, moral quandaries than those early Call of Duty games set in World War II. War gaming's shift in time and tone could be in part due to the United States' own recent experiences with war. Video game developers no longer have to look to history for relevant topics about conflict and warfare. The latest Medal of Honor title, for instance, takes place in a modern day Afghanistan. And basing games on today's wars also makes them feel more relevant. But they do run the danger of dealing with topics that have yet to be fully explored, or even understood. Perhaps, that too is part of the attraction.